Getting ready to renovate your patio or deck in time to enjoy the hottest months of summer? Consider the impact on both your backyard and the environment at large. After all, the point of a patio is to enjoy nature without abandoning the creature-comforts of home. 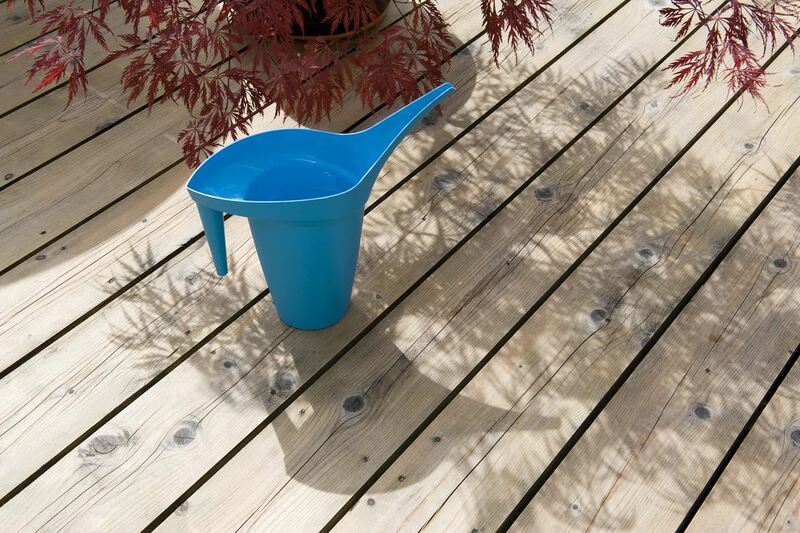 Next time it rains, take a look at your patio. Chances are that it's made of concrete, which absorbs very little water. The rain is therefore washed into your yard, carrying with it rich topsoil and depositing it in your neighbor's yard. Instead of concrete, consider one of these attractive previous patio surfaces. If you can't live without the look of concrete, try previous concrete instead of the traditional variety. This porous concrete allows up to five gallons of water to soak into a square foot per minute. Rather than install a solid surface, opt for interlocking pavers. Permeable pavers are available in a variety of styles and patterns, and the gaps can be filled with ground cover, gravel or grass, depending on your aesthetic preferences. Another intriguing product is Grasspave by Invisible Structures. Comprised of a grid of polymer cylinders, this paving material is rolled onto your yard like a carpet. It protects grass's roots while preventing runoff and is even firm enough to park on. Most decks are built with wood, which of course requires that innocent trees be sacrificed for your lounging pleasure. On top of that, it's nature's job to break down natural wood, so maintaining your deck can be an uphill battle. However, if you must build that wooden deck, keep in mind that some types of lumber are more sustainable than others. The two "greenest" lumber types that we repeat here ad nauseam are reclaimed lumber (from building demolitions) and Forest Stewardship Council (FSC) certified lumber, which is harvested through responsible forestry practices. Still, these wood decks require annual maintenance in the form of painting or staining. A more durable option is composite decking materials, in the form of boards made from recycled plastics and wood fiber waste. This material is a pretty green choice upfront, but it is difficult to dispose of because it contains biodegrade materials combined with other materials such as fiberglass and waxes, which require a completely different recycling process. Plastic lumber is made from 100% recycled plastic in the form of PED, HDPE or LDPE and is available in many "non-fading" colors and textures, including those designed to look like natural wood. Treating lumber helps make it resistant to rot and termites, but the chemicals used are often toxic. In the past, common preservatives included poisonous pentachlorophenal, chromated copper arsenate (CCA) and creosote. "Safer" alternatives are copper azone (CA) and amine copper quat (ACQ), but wood treated with these chemicals can't be burned or recycled. Borate is a better wood treatment, and though it can't come into contact with the ground because it's water soluble, this substance is non-toxic. High powered flood lights burn plenty of energy and don't exactly create ambiance. Instead, select energy saving patio light fixtures including solar and LED powered lights. Solar lights are available in many different styles, including lanterns, globes, spotlights and even insect shapes. They are incredibly easy to install since you don't have to deal with electrical wiring, but location is everything: solar lights won't work in the shade! LED lights, which work with both solar and electrical fixtures, can take the form of step lights, pendants, lanterns, spotlights, and sconces. They use little energy, but some complain that the bulbs burn a harsh white. Try using colored lenses to help soften and diffuse LEDs. A fun, easy to install option is LED string lights. Twist them around your umbrella or in a small tree for a whimsical effect. If you've gone to the trouble of greening your patio decking, paving, and lighting, it would be a waste to plunk down just any patio furniture. Be green without sacrificing style. For those whose hearts are set on wood patio furniture, provide used furniture with another life (and save some money!) or buy new furniture bearing the FSC logo. Teak wood is a popular choice for outdoor furniture because it's strong and weathers well, but this tropical tree takes many years to mature. Bamboo, a rapidly renewable material, is a more eco-friendly material choice for your patio furniture. If you're open to a material besides wood, look for patio furniture made from recycled materials such as plastics, like those made by Poly-Wood. Your backyard may seem like the "greenest" part of your home, but there's always room for improvement. The best patio and deck designs allow you to enjoy mother nature without endangering her.